Would we be better off with an algorithmically controlled overlord? If company CEOs can be replaced by computers, why not the president of the United States? That, in fact, is exactly what's been proposed for IBM's Watson. Watson has already made quite a name for itself, of course, dating back to its 2011 victory on Jeopardy. Since then, it's gone on to make medical predictions, critique written text and offer insight on product performance, among other accomplishments. Now, a group called The Watson 2016 Foundation -- which "has no affiliation with IBM," according to its Watson for President website -- has emerged to help promote the cognitive computer's presidential prospects. Watson was designed to compete against humans by understanding a question, using key information to analyze vast volumes of data and then deriving the best possible answers, the group notes. 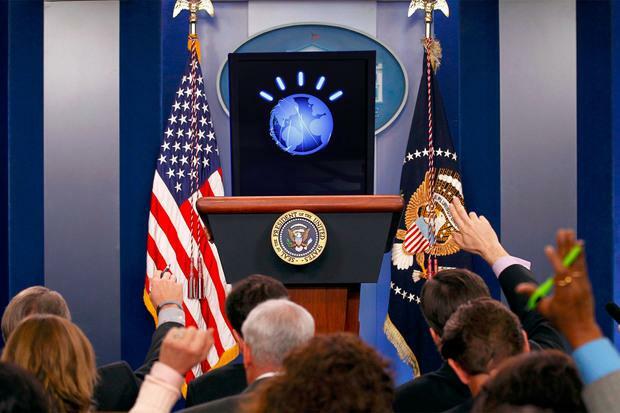 "This is a task all politicians undergo on a daily basis, including the president, and could be more suitably and efficiently executed by an artificial intelligence," Watson for President says. "Watson’s capabilities for parallel processing on a given query allow it to evaluate concerns on a variety of metrics, gauging the most beneficial response across all areas," the website says. "Watson can advise the best options for any given decision based on its impact on the global economy, the environment, education, health care, foreign policy, and civil liberties." Ready to welcome this new AI overlord? You can keep your wallet in your pocket for now: The Watson 2016 Foundation is not accepting donations at this time and does not expect to in the foreseeable future. "IBM made 12 billion dollars last year, so contributions from the public are not required for the continued research on Watson," the website says. People who want to support Watson are encouraged to donate to the Electronic Frontier Foundation instead. In the meantime, while it's clearly a stunt, the effort also offers some food for thought. "Just in the same way humans have facial expressions to convey emotions, Watson changes its visual form to express its level of confidence in a selected answer," the foundation's website notes. "Wouldn’t the country be better if all politicians were that transparent?" So, would you vote for Watson? You can share your view in a poll now under way on the Watson for President website.